Gatlinburg City Hall is located at 1230 East Parkway, Gatlinburg, TN 37738; phone: 865-436-1400. Photo: Noah "Bud" Ogle Cabin, ca. late 19th century, Gatlinburg, TN. Listed on the National Register of Historic Places in 1977. Photographed by user: Brian Stansberry (own work), 2007, [cc-by-3.0 (creativecommons.org/licenses/by/3.0)], via Wikimedia Commons, accessed October, 2015. The City of Gatlinburg  is situated in Sevier County at the main entrance to the Great Smoky Mountains National Park. The city and county are a part of the sixteen county East Tennessee Region with Gatlinburg located in the south central sector approximately forty miles southeast of Knoxville—the principal city in the region. Two principal transportation routes link Gatlinburg to the region and the remainder of the nation. United States Highway 441 serves as a north-south corridor and Tennessee Highway 73 provides an east-west linkage. Each year, millions of visitors utilize these routes to visit Gatlinburg and the national park. The mountain terrain in Gatlinburg ranges from 1,200 feet to 3,500 feet above sea level. The bulk of Gatlinburg's earlier development was located on the valley floor between the steep ridges, but as the valley has become more densely developed, more recent residential development has occurred on the steeper slopes of the mountains. 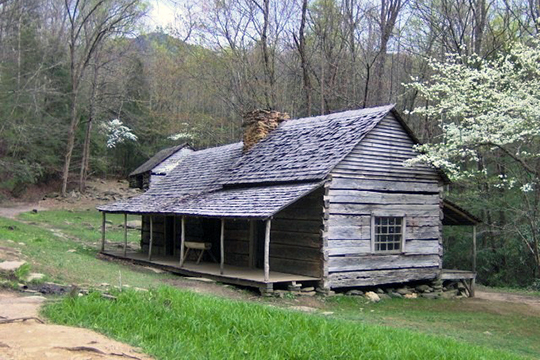 In the early 1800's, Gatlinburg was known as White Oak Flats and consisted of a few shops, a church, and a school. Residents were employed in either farming activities or the lumber business, which owned the majority of land now located in the National Park. The first hotel was built in 1916 to provide housing for the lumbermen working in the nearby forests. This was the Mountain View Hotel and it remains standing today. The destiny of Gatlinburg was forever changed when, on June 15, 1934, the United States Congress established the Great Smoky Mountains National Park. Today Gatlinburg is known as the Gateway to the Smokies and each year millions of tourists come to relax and to enjoy the scenic vistas of the Smoky Mountains. This tremendous influx of visitors to the Park has made the city one of the leading resort centers in the nation and has brought prosperity to the economy of the city, county, region, and state. While tourism has been beneficial to Gatlinburg, some serious problems have been created as a result of this continuous influx of visitors. The city has a resident population of less than 3,500, but it has to provide services for up to an additional 60,000 visitors on peak tourist days. Therefore, traffic and pedestrian congestion present major problems for the city. Additional problems are created by the physical limitations to development because of the steep slopes and the potential for flooding of the flatter lands. It is very expensive to expand services with these constraints. These problems are very real and they must be effectively dealt with to ensure the continued economic growth and success of Gatlinburg in the future. Department of Economic and Community Development, Local Planning Assistance Office, Land Use Plan, Gatlinburg, Tennessee, 1991, www.gatlinburgtn.gov, accessed October, 2015.